The Archaeological Investigations Project (AIP), funded by English Heritage, systematically collected information about the nature and outcomes of more than 80,000 archaeological projects undertaken between 1990 and 2010. This volume looks at the long-term trends in archaeological investigation and reporting, places this work within wider social, political, and professional contexts, and reviews its achievements. Information was collected through visits to public and private organizations undertaking archaeological work. Planning Policy Guidance Note 16: Archaeology and Planning (known as PPG16), published in 1990, saw the formal integration of archaeological considerations with the UK town and country planning system. It set out processes for informed decision-making and the implementation of post-determination mitigation strategies, defining a formative era in archaeological practice and establishing principles that underpin today’s planning policy framework. The scale of activity represented – more 1000 excavations per year for most of the PPG16 Era – is more than double the level of work undertaken at peak periods during the previous three decades. This comprehensive review of the project presents a wealth of data. A series of case studies illustrate different types of development project, revealing many ways in which projects develop, how archaeology is integrated with planning and execution, and the range of outputs documenting the process. It then identifies a series of ten important lessons that can be learned from these investigations. 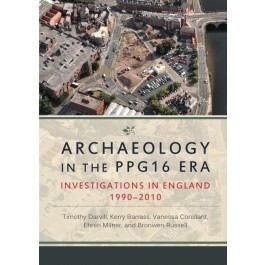 Looking into the post-PPG16 Era, the volume considers anticipated developments in the changing worlds of planning, property development, and archaeological practice and proposes the monitoring of archaeological investigations in England using a two-pronged approach that involves self-reporting and periodic strategic overviews.